Adam was a real-live, flesh-and-blood human being - or else he wasn’t. As much as we might like an intermediate position, something in between, or a happy compromise, it’s not possible. We either can believe there was an Adam wearing his fig leaf, or we can have an Adam who was only a figment. As much as the issue can be couched in theological double-speak, there is no escaping a fundamental fact of life, or non-life. A real Adam either existed, or he didn’t. The rationale for eliminating Adam from the roles of those who once breathed air is simple. The Neolithic surroundings of Adam’s immediate family prohibit him from having lived far enough back in time that he could be the forerunner of those who lived in times quite ancient. Adam’s sons raised grain and livestock. Stone Age men foraged for food where they could find it and chased reindeer herds. Seeing a logical impasse, it made sense to some to simply remove Adam from life’s scene and establish him as a theological ruse. Gone but not forgotten. On the other hand, a flesh-and-blood, real Adam is not exactly without difficulty either. The other side of the problem is that traditional, conservative, Christian beliefs about Adam are based not entirely upon scriptural evidence, but also upon an unworkable assumption. Traditionalists see Adam as both a flesh-and-blood human being, and as the father of all humanity everywhere. The premise that Adam was the father of all human beings on the face of the planet is likewise fraught with contradictions. Remains of early humans and their precursors have been found dating beyond millions of years. 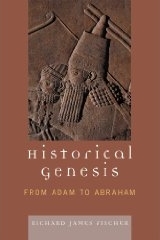 The cultural surrounding of Genesis places Adam and his successors after the Old Stone Age and at the threshold of the Bronze Age, a time frame called the Neolithic Age (New Stone Age). References to tents, farming, livestock, musical instruments, implements of bronze, and even iron in the Genesis narrative give us a rough timeframe where Adam and his immediate generations belong. And here is the fact of "life." Placing Adam in history also places him in the stream of humanity, not at the apex of humanity as has been commonly assumed. The answer to the theological question of Adam is to recognize the historical Adam as the father of the Adamites-Semites-Israelites-Jews. To be sure, there are pockets of humanity who can claim Noahic ancestry, and both Arabs and Jews regard Abraham as their father. But there is no conceivable person living between 6,000 and 7,000 years ago who could have been the ultimate father of all the people who presently inhabit the globe. When we consider that, some of the apparent Bible and science conflicts actually disappear.